Turquoise Place Resort beachfront condo for sale in Orange Beach Alabama. This beachfront property has a cheerful decor, black granite counter-tops and engineered hardwood flooring in the bedrooms, indicative of the care and attention the owners put into the décor. The kitchen is spacious with Sub-zero/Wolf appliances and a large gas range. The gulf-front property has a gas fireplace, a wet-bar with ice maker, crown molding and a private balcony with a gas grill and hot tub. Step onto that balcony from the living room or mst. BR. The mst. BA is sizable and has a large, tiled shower, jetted tub and a walk-in closet. 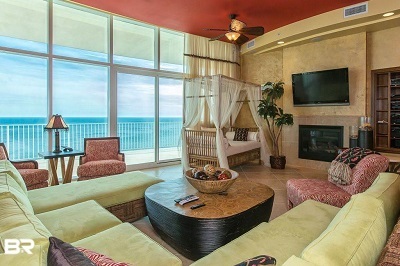 This resort home has incredible views Perdido Pass and the sugar-white beaches on Alabama’s Gulf Coast. The community amenities are second to none, with multiple indoor & outdoor pools, modern exercise facility, sauna & steam rooms, an outdoor bar & grill area, a lazy-river, tennis courts and more. This unit has a long, established rental history…you have to see this condominium! The post Turquoise Place Resort Condo For Sale in Orange Beach AL appeared first on USBeaches.net.